Scientific literature does not clearly define the term "food craving," but generally means an intense desire for a particular food. Craving a substance like salt or black pepper may indicate a physiological need or nutritional deficiency. A psychological association of a memory or emotion with the flavor you yearn for can also trigger a craving. Cravings may indicate a mineral or other nutritive deficiency, according to Dr. Alan R. Hirsch, director of Chicago's Smell and Taste Treatment and Research Center. Craving salt, for example, may indicate a need for sodium, calcium or other minerals, all of which you can boost in the bloodstream by eating salt. Craving spicy foods can also be akin to an addiction, creating a pleasant rush of an accelerated heart rate, rapid breathing and perspiration. Black pepper is rich in iron and vitamin K, and has antioxidant and antibacterial properties, according to HealthChoice, a dietary information resource of the Oklahoma State Government Insurance Board. Piperine, the pungent component of black pepper that can make you sneeze, stimulates digestive enzymes and renders the nutrients in many foods more easily accessible for absorption by the body. Piperine improves brain function, and may help the body heal and fight the damaging effect of substances like cadmium. A black pepper craving may indicate a physiological need for the nutrients in black pepper, or those which black pepper makes more available to the body. Some medical scientists believe that physiological need or nutritional deficit cannot completely explain cravings. Psychological and emotional factors such as stress and anxiety, or an association with a pleasant memory involving a particular taste or food, are likely to trigger a craving, reports MSNBC Diet and Nutrition. Food cravings are more common among women than men, most strongly at pre-menstrual times and during pregnancy, according to the doctorate thesis of Corby Martin at Louisiana State University. A black pepper craving may arise from remembering the appearance or aroma of a black pepper-laced dish, especially if you consumed the food on a happy occasion. Food cravings can trigger unhealthy eating binges, reports ScienceNews.com. Eating binges can also lead to a sense of guilt or embarrassment. If a nutrient deficiency causes a craving, it may indicate a serious health condition. Consult a physician to determine if a nutrient deficiency may be the underlying cause of an intense black pepper craving. 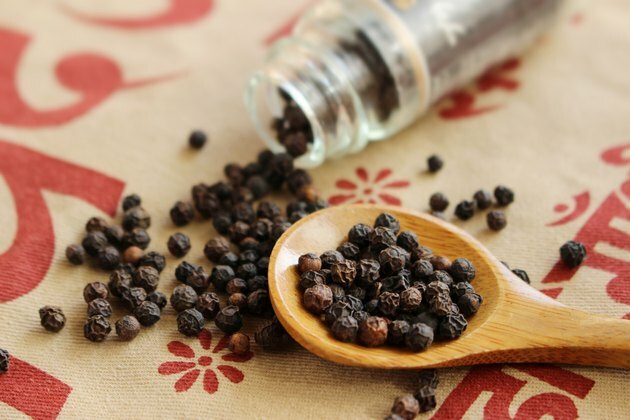 Black pepper can also increase serotonin and may boost the effects of some anti-depressant drugs, so consult your physician regarding any potential medication interactions before satisfying your craving with a black-pepper encrusted eating binge.